Do you suffer from brain fog or fatigue? Perhaps you have trouble digesting your food, or worse, you suffer from stomach pain or irregular bowel movements. 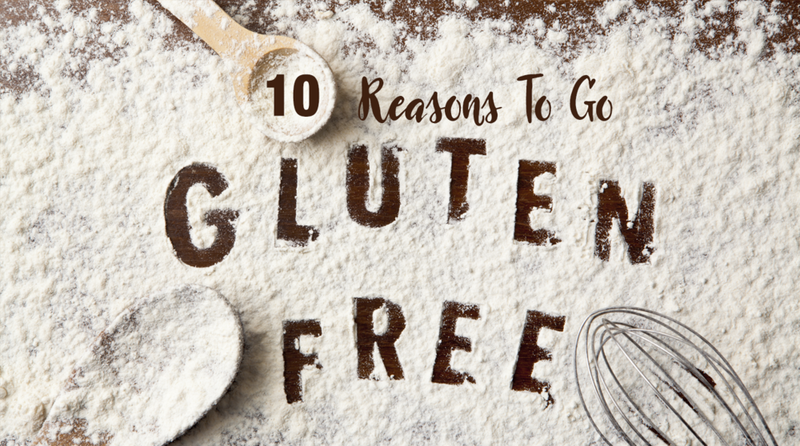 Whatever reason has led you to consider kicking gluten, here are 10 reasons to try going gluten free. Many people are sensitive to gluten without even realizing it because gluten is in everything. Going gluten free involves a greater commitment than simply avoiding bread and beer. In fact, gluten is in everything, not just wheat, barley and rye. Gluten can even work its way into seasonings, spices, chicken broth, salad dressings, soy sauce, and more. It becomes hard to trace a gluten allergy when only common gluten sources like pasta and grains are cut out. So, first step to going gluten free? Read labels and cut all traces of gluten to eliminate the risk of getting glutened. Ever feel bloated after you eat? Or worse, chronically bloated even though you eat relatively healthy, avoid junk food and exercise? Truth is, the gluten in wheat converts into sugar, or glucose, which in turn raises insulin and causes inflammation. The good news is that by cutting out gluten from your diet, you’re minimizing inflammation on a cellular level. Adding to the inflammation gluten causes, wheat has a major influence on blood sugar. Gluten is most often found in high carbohydrate foods. In the body, many carbs convert to sugar, so the more carb-rich foods in your diet, namely those including gluten like bread, pasta, and grains, the more often blood sugar levels spike higher than the normal, or considered healthy, range. What is Leaky Gut Syndrome? Essentially, it’s when holes or cracks in the intestinal lining release undigested food particles and bacteria into the blood stream. Ultimately inflicting an autoimmune response of inflammation and allergic reactions. How does gluten cause leaky gut? Gluten is hard for the stomach to digest, resulting in “leaks” of gluten proteins along with other toxic waste into the bloodstream. And the cycle continues. If you’re suffering from symptoms associated with Leaky Gut Syndrome like nutritional deficiencies, digestive issues, or excessive fatigue, nixing gluten is a great method to initiate the healing process. The most commonly associated symptoms of eating gluten are brain fog and fatigue. What’s worse, gluten can negatively induce symptoms on a neurological level, even leading to depression and anxiety. In studies examining “your brain on gluten,” and the symptoms people experience after getting glutened, researches found that it can take 4 hours to 7 days for your brain to recover from brain fog induced by gluten. If brain fog is debilitating you, a gluten-free diet can help tremendously to alleviate the fog and get you thinking clearly again. While adversaries of the gluten-free diet will have you believe that gluten holds nutritional value, that age-old theory isn’t holding up when it comes to modern gluten products. Ever notice an ingredient label that includes “refined” or “enriched” gluten? That’s because manufacturers straight up remove the nutrients from gluten products, then add synthetic (fake) ingredients to increase the nutritional values. What you’re left with is an artificially enriched product, and how healthy can that be on the body? Science about diet and infertility is rapidly developing, and the results are eye opening. While we land our skeptical eye on gluten, it’s more likely that undiagnosed celiac disease and gluten sensitivity can cause unexplained infertility. This means that for a woman with no other feasible reasons causing infertility, cutting out gluten may likely increase the chances of conception. So, as the research develops linking gluten to infertility, it may be beneficial to cut gluten if you’re planning for parenthood. Inflammation, bloating, stomach pain, irregular bowel movements, the list goes on. Digestive issues run the gamut, and can likely all be attributed to allergens your body is rejecting. Remember how gluten is an allergen? Bingo. If your body is riddled with digestive problems, it might be a good time to go gluten free. The best news about making the decision to adopt a gluten free diet is that it’s literally never been easier! That’s right. It may seem like a daunting task at the starting line, but trust me, there are rich resources available just waiting for you to grab and use! Stroll the health-food aisle at your local grocery store with fresh eyes and you’ll notice tons of labels boasting “gluten-free.” Furthermore, there are a myriad of available cooking alternatives to help you adjust to your new gluten-free diet including coconut, almond and rice flour, not to mention all of the natural options available like fruit, veggies, proteins, healthy fats and more. As you can see, there are a multitude of reasons to adopt a gluten-free diet. Going gluten free yields major health benefits, not to mention how good you’ll feel physically, mentally and emotionally. Need a launchpad to propel you into your new gluten-free life? Order my cookbook, Wandering Palate, which includes 120 internationally inspired gluten-free recipes, and a 28 day meal plan to get you going on your gluten free journey. Ready To Embark On Your Gluten Free Journey? Join my workshop, Goodbye Gluten starting Jan 2019! The New year is a perfect time to start putting your health first.